The Glenburn MWFC 2003 / Under 12 Team train on a Wednesday night 6pm – 7.30pm outside Glenburn Primary School during the summer and training at Powerleague in Kilmarnock in the Winter but hope to get a let at Prestwick Academy this winter. Cost is £20 per month per player. In April the 2003 coaches undertook a 7’s to 11’s player pathway course at Rugby Park that allows the Under 12 team to play 11 a side friendlies in the build up to the first 11 a side season starting August. All players, parents and coaches really looking forward to this! 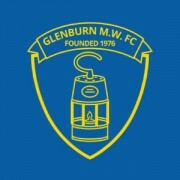 The 2003 Team play on Sunday mornings in the West of Scotland 7 a side League where they have 2 teams – Glenburn MW United and Glenburn MW Thistle. They all train together and the boys are mixed up from week to week in preparation for one 11 a side team. Under 12’s home pitch is Prestwick Academy and kick off is at 11.30am for 60 min games (2 x 30 min halves). The 2003s currently have 15 boys who are all signed. Next year 2015/ 2016 the 2003 team moved from playing 7 a side to 11 aside. If you are ready to open your mind and make a commitment to yourself then the Fit Body Farm REALLY IS for you.